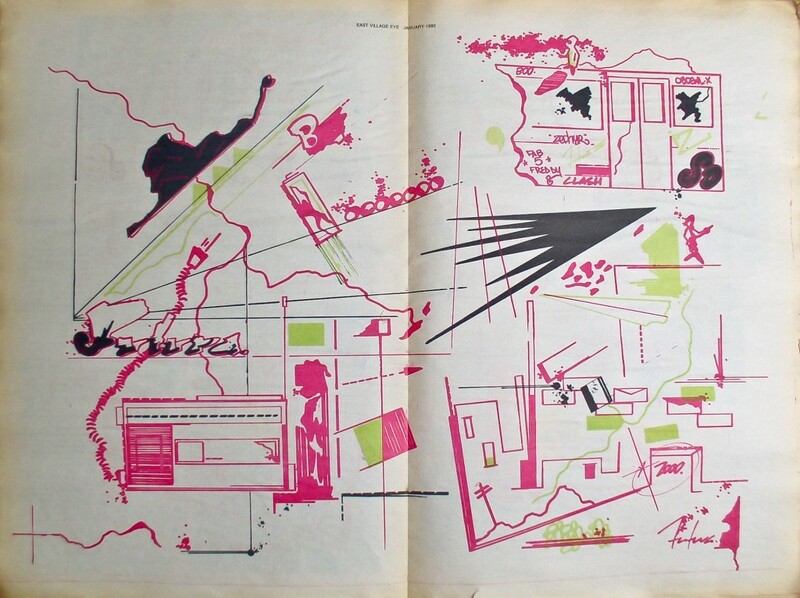 January 1982 centerfold by Futura 2000. East Village Eye, January 1982. Gallery 98 has recently re-stocked some of the most coveted issues of the East Village Eye. 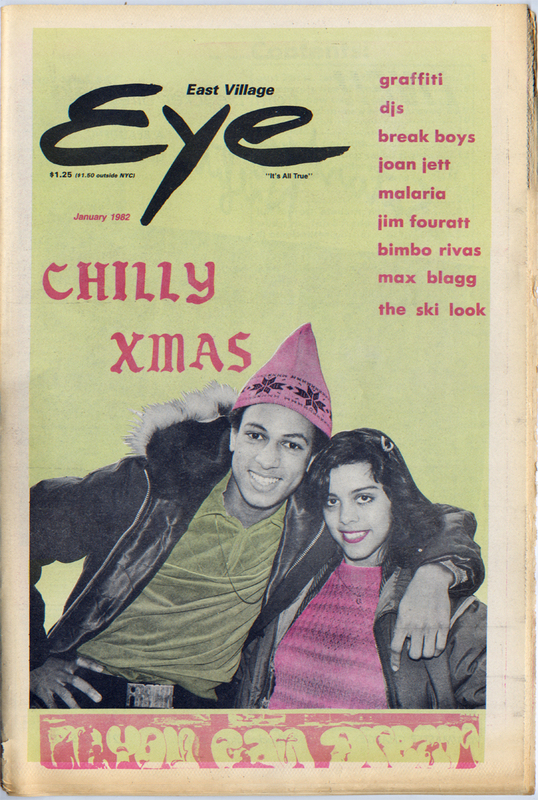 A major stand-out is the “Chilly Xmas” issue of January 1982, with its prime early coverage of hip hop culture. Futura 2000 designed the centerfold; Lee Quiñones also contributed art. Of special note is Michael Holman’s interview with Afrika Bambaata, which (according to some) includes the first print appearance of the term “hip hop.” This issue has long been the most difficult to obtain, and it was a stroke of luck to get our hands on several copies. 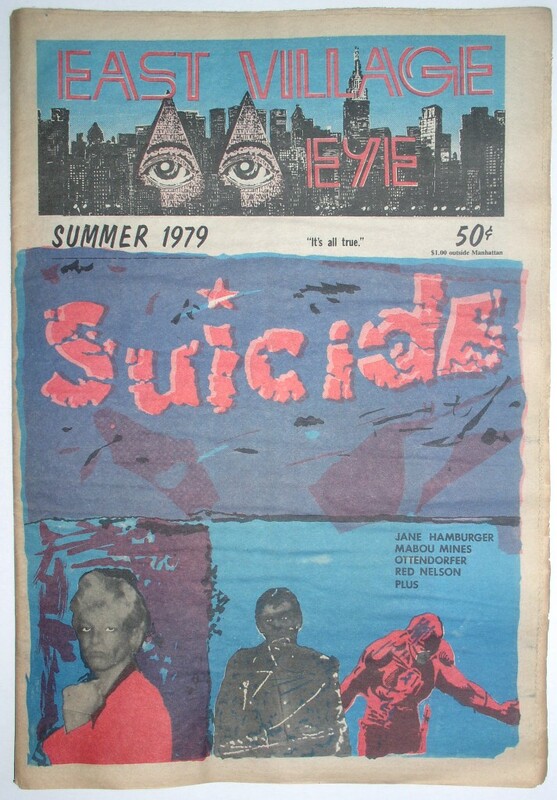 We have also obtained select copies of thesummer 1979 issue, for which Alan “Suicide” Vega provided both cover art and a conversation with legendary art critic Edit deAk. The issue includes a full-page article on film-maker and “queen of the Mudd Club” Tina L’Hotsky, and a centerfold by Eye art director Christof Kohlhofer, starring Warhol superstar Taylor Mead. Another re-stocked issue, from October 1983, captures the East Village arts scene at its height. 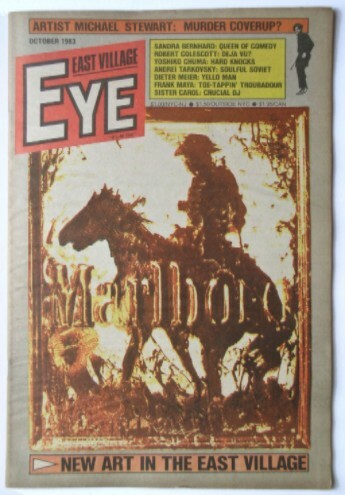 Richard Hambleton’s cover art parodies Richard Prince’s “Marlboro Man” series. Joe Lewis of Fashion Moda interviews painter Robert Colescott. Marc Miller’s column “Miller’s Memorabilia” resurrects the vandalism of Picasso’s “Guernica” by Tony Shafrazi, who had since become a respected gallerist with a stable that included Keith Haring. The reviews section, edited by Walter Robinson (with Carlo McCormick), highlights recent exhibitions by Kiki Smith and David Wojnarowicz. The East Village Eye, published by Leonard Abrams from 1979 to 1987, is the paper of record for a dynamic decade when the East Village was home to huge transformations in punk, hip hop, and art. Early issues are extremely scarce. We are looking forward to an East Village Eye exhibition, curated by Abrams, at Howl! Happening this fall.